I remember as a college student in the late 1980’s in Eugene, hearing stories from the members of local Temple of the intentional community that had just collapsed. Seven families and several singles shared organic gardens, Jewish holidays, hosted thousands of people for spiritual retreats over five years from l983-88 at Moshav Shivtei Shalom, on the shores of Dorena Lake, l5 miles east of Cottage Grove, Oregon. Composed of hipped out Jewish Renewal folks, followers mostly of Reb Zalman and Reb Shlomo, they had rejected the boring Judaism and Jewish community and sought to create an intentional Jewish community…in rural Oregon. I was just returning from a year in Israel on Habonim Workshop, a majority of which I spent at Kibbutz Gezer. The spiritual communal aspects of the Oregon Moshav sounded wonderful, as I had become disillusioned with the highly secular life of kibbutzniks. But the Moshav couldn’t make a living just hosting spiritual retreats, and commuting to jobs outside the community. By the time I got there, the Moshav families were attempting to integrate into Eugene’s Jewish community. Many become friends and mentors, including Rabbi Hanan Sills, my first real spiritual mentor. Will Aleph spring make it? I don’t know. Part of the problem of all intentional communities is funding- how to make money. Assuming the community can come up with some revenue generating businesses like hospitality, consulting, a clinic etc. they have a chance at overcoming the first hurdle. The second major hurdle are the challenges presented by micro-community living. If there is a central leader, that can be problematic, and if there is a consensus model that can be problematic. Who makes decisions on big issues can literally tear a community apart. There are the positive sides, the things which draw one to intentionally community. Its a Utopian dream. But all Utopias have troubles with their kids, who are not part of the decision to pull away from the mainstream, they feel trapped by the community. They are not the idealists, it was their parents. And they get to know each other too well. And while it doesn’t mean they will be messed up, it means they will likely leave the community. ; based on just what I have read- will be smarter, and just use the community for living in proximity to each other. They have a chance – they are not a commune, or an intentional community in the traditional sense, but an intentional development. Like ones built for avid golf players, theses are avid shul goers. It could work, with the right shul, the right city, the leaders, and the right tude. These Jewtopians by building an intentional development are using a mostly successful model and applying Jewish needs. I would recommend that they 1) hold back an apartment or two for rentals. People come to the area all the time for the Shakespeare Festival, and they can earn some money to support the shul. They should consider 2) a community space, multi-purpose room, as well for functions. Lastly, I don’t know if this is part of their plans, but without a 3) Mikvah, their community will not have the spiritual help and foundation it needs to survive. The mikvah is the most important facility, far more important than a shul. You can pray in a converted garage, you can’t mikvah in a swimming pool. NPR was discussing Bibi’s upcoming talk, and whether Bibi would discuss the situation with Iran. They actually referred to the Iranian Madman Ahmedstolehisjob, the man who wants to “wipe Israel off the map,” and is building the means to do so, as a “critic of Israel.” I nearly threw up. 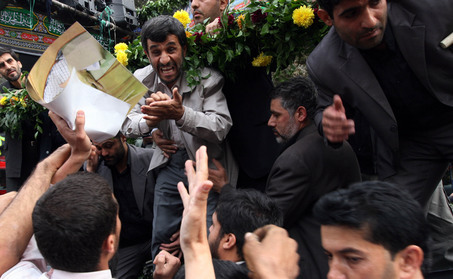 NPR, CNN, they deal with the elections in Iran as if they are in some kind of legitimate democracy. Boker Tov Chevre – you are on some kind of permanent trip, you took too many shrooms at Wakarusa, you are living in a skunky haze at an LA Farmacy. You are totally out of touch with reality. Iran is an Islamic Totalitarian theocracy with a fascist hold on the media, and a misogynist, xenophobic, anti-Jewish agenda. They arrest and imprison political prisoners at will, funnel millions of dollars to terror groups like Hizbollah and Hamas, advocate the genocide of the Jewish people. Sheesh. While we might not love Bibi, he is the least humble Israeli politician in history, he was elected in an uncontested contest. Bibi’s opponents were not arrested after his victory. His police did not shoot at and tear gas protesters in the streets. Bibi did not turn off access to mobile phone texting, twitter, BBC, and a host of other media to lock out his people. Why oh why do they equate the two? Makes me start to appreciate FOX, oy vey. George Orwell? Where are you George?